Thursday’s UFC 196 pre-fight press conference inside the David Copperfield Theater at MGM Grand in Las Vegas was everything we expected it would be. McGregor was only 35 minutes late, per usual. The UFC featherweight champion had plenty to say, per usual. Nate Diaz barely said anything substantial, per usual. They flung insults and f-bombs at each other from across the podium, per usual. Oh, and there was another intense face-off at the conclusion of today’s presser. However, unlike their previous square-off two weeks ago, they got physical today and needed to be separated. Both fighters walked aggressively to the center of the stage to face-off, where UFC president Dana White well prepared to keep them from trading blows. Diaz got in a long fight stance with his right fist extended directly in McGregor’s face. Obviously, McGregor wasn’t having it and angrily swiped Diaz’s fist away. White grabbed Diaz and White’s bodyguard held McGregor back. Jake Shields, Diaz’s longtime homie and training partner, quickly jumped on stage. White’s bodyguard then released McGreogr, for some reason, to stop Shields. Members from McGregor’s team and Diaz’s squad then stormed the stage. Several security guards and cops rushed the stage before all hell broke loose, a la Jon Jones and Daniel Cormier. Thankfully for all involved, no punches were thrown. Although, the altercation should help sell some more pay-per-views. 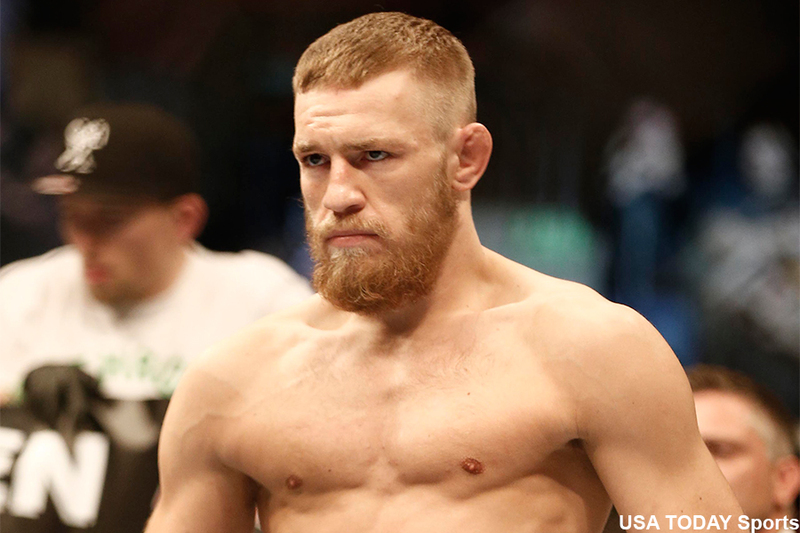 McGregor and Diaz headline UFC 196 on Saturday inside MGM Grand Garden Arena in Las Vegas. Please click HERE to watch the entire press conference.